The IBM® System Storage® SAN42B-R extension switch is designed to maximize performance and scalability for large, complex environments. It is a purpose-built extension solution that securely moves more data over distance, faster—while minimizing the impact of disruptions. 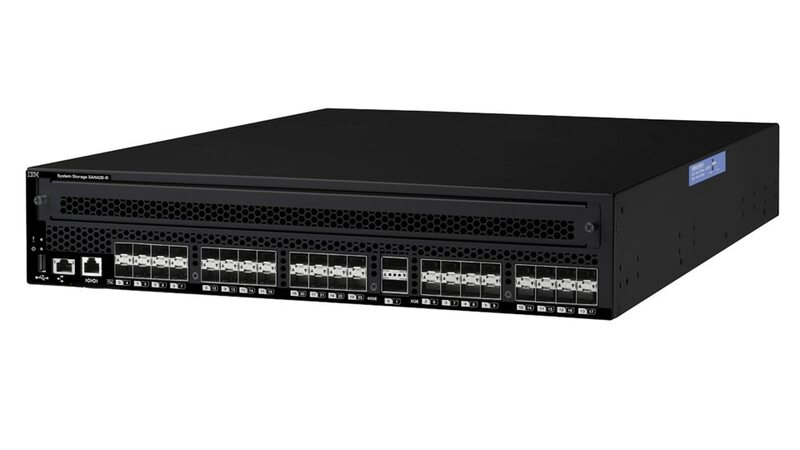 With enhanced extension capability and Fabric Vision technology, SAN42B-R delivers outstanding performance, strong security, continuous availability and simplified management to handle the unrelenting growth of data traffic between data centers in Gen 5 and Gen 6 Fibre Channel and FICON storage environments. The SAN42B-R extension solution enables moving more storage data between data centers to meet disaster-recovery and business continuity objectives with industry-leading performance and scalability. Consolidate Fibre Channel and IBM® FICON® storage traffic from heterogeneous devices for high-speed, high-availability and secure transport between data centers. Designed for maximum flexibility, the extension switch offers pay-as-you-grow scalability with capacity-on-demand upgrades to quickly and cost-effectively scale WAN rate and add bandwidth on demand.